Walk down the aisle in a very beautiful bridal gown like this. 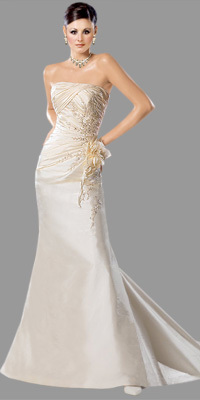 The dress is strapless and the bodice is ruched and embroidered. The right side of the gown has a floral embellishment placed. As the dress flows downwards it becomes very flary and that makes this dress look like a typical bridal gown. The train at the back of the dress completes the look.